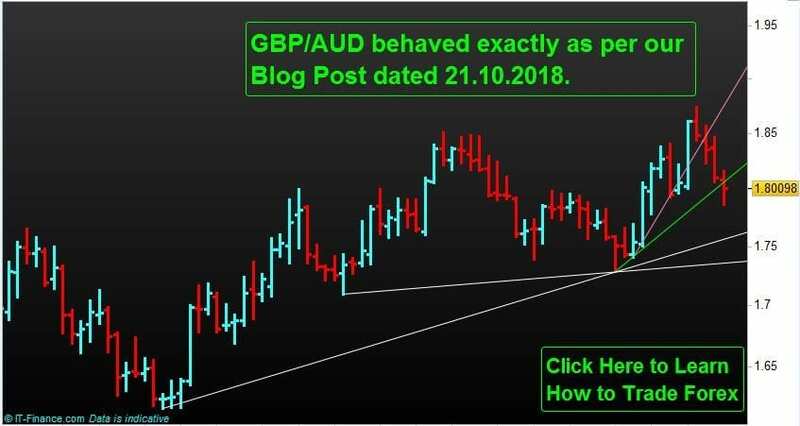 Forex Pair GBP/AUD behaved as per our Blog Post dated 21.10.2018. In our post dated October 21st, 2018, we highlighted the possible move of Forex Pair GBP/AUD with the help of our Technical Analysis. In that post we wrote, “Since the price has closed below the first trend line (the pink line in the below chart) for the Forex Pair GBP/AUD there can an opportunity for the price to come and test the second trend line (the green line in the below chart) for Forex Pair GBP/AUD. Exactly that happened as shown in the above chart in the week completed last Friday. Price of Forex Pair GBP/AUD touched the green line on week number 44, which got completed on 02.11.2018. When we posted on OCt 21, 2018 for Forex Pair GBP/AUD, the price was at 1.8352. According to our technical analysis for Forex Pair GBP/AUD the tentative price projection was 1.8050, a solid drop of a massive 300 PIPS (Percentage in Points). This drop of 300 PIPS and more (since price closed at 1.8009) happened in just 2 weeks and just after our post for Forex Pair GBP/AUD on 21.10.2018. Now the question is what the price of Forex Pair GBP/AUD going to do in future. To technically identify the next possible price objective for Forex Pair GBP/AUD in the Professional way so that it will be easier for you to Trade Forex Pair GBP/AUD in future from the current level and to find out the answers to all your Trading related queries, please contact us at 03 9566 7275 and book your FREE discussion session for 30 minutes at Level 3, 2 Brandon Park Drive, Wheelers Hill, Victoria 3150. 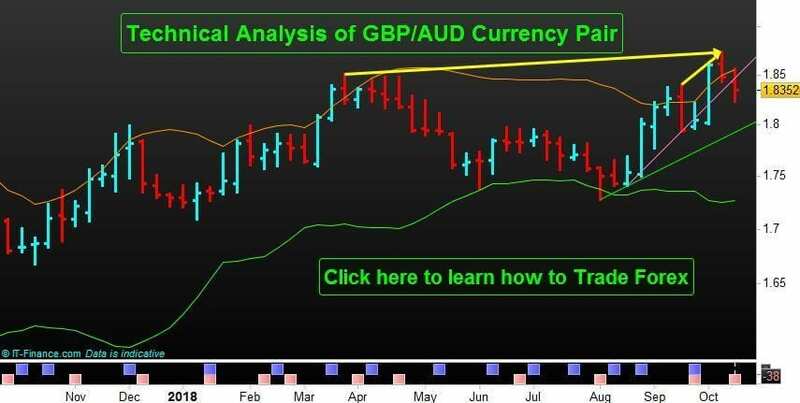 Now you can learn to trade Forex Pair GBP/AUD with us to explore the possibility of earning passive income keeping your day job. Our Proprietary Forex Trading Strategy which work will guide you through every step of your trading in Forex Pair GBP/AUD and explore the possibility of earning extra income. Learn what all other Forex Currency Pairs we are Trading in our Forex Trading Asset Class. Develop yourself as a professional trader capable of capturing second income in the future with us. On completion of the “Basics of Trading” course, You will develop an In-depth understanding of Fundamentals factors moving Markets. You will be able to clearly understand the Market Jargon e.g. Swaps, Spread, Slippage, Margin, Leverage, Tom-Next etc. You will also know more about why we are saying, “Aussie is following our way”. Learn Trading from our A full-time Professional Trader. This is a step by step hand holding program designed keeping in mind your learning progression. You will also know more about why we are saying, “Aussie is following our way”. A full-time professional trader from NPF (Professional Proprietary Trading firm) will be your own personal coach for 3 months. It will give you twelve, one-on-one coaching sessions. You will be attending one monthly Seminar. You will also know more about why we are saying, “Aussie is following our way”. A full-time professional trader from N P Financials will be your own personal coach for 6 months. You will be introduced to our Proprietary Trading Edge. It will give you twenty-four, one-on-one coaching sessions. You will also know more about why we are saying, “Aussie is following our way”. A full-time professional trader from N P Financials will be your own personal coach for 9 months. You will be introduced to our Proprietary Trading Edges. You will also know more about why we are saying, “Aussie is following our way”. A full-time professional trader from N P Financials will be your own personal coach for 12 months. You will be introduced to our Proprietary Trading Edges. You will also know more about why we are saying, “Aussie is following our way”. A full-time professional trader from N P Financials will be your own personal coach for 3-6 months. You will be trained on how to learn the Market Programming Language. A full-time professional trader from NPF will be your own personal coach for 3-6 months. You will be trained on how to Develop your Market Scanning Edge. A full-time professional trader from NPF will be your own personal coach for 3-6 months. You will be trained on how to Build your Trading Edge. Take Advantage of On-Demand Learning from popular One Day Courses. Identify Correct and Relevant Market Reversals through advanced Candlestick Charting. Understand Market Evaluation through our specialized Fibonacci Techniques. Understand correct Price Plot Patterns.